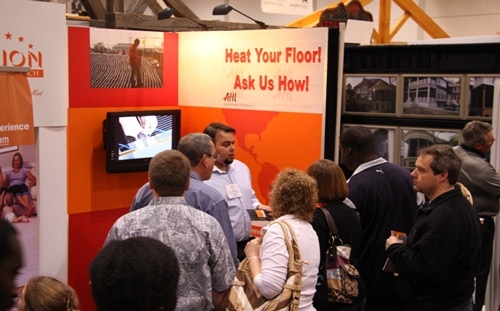 ORION ECO TECHNOLOGIES LTD participated very successfully in the National Home Show in Toronto between March 16-25, 2012. The dynamic ORION team led by Ella and Sergey Petrenko presented the unique AHT advantages to the thousands of visitors who visited who passed through their stand during the ten days of the exhibition. The response of the Canadian consumers was incredible and a number of new projects have already been confirmed for both the AHT Indoor and Outdoor heating systems. It is clear that with the hard and persistent work of the ORION team during the last year, the prospects of the Canadian market are very encouraging for AHT. We are sure that ORION will achieve all their targets and secure a commanding position in the market for the AHT products. We would like to thank them for their professionalism and constant and undiminishing support and wish them all the best for the future.